Included in this category are pusher and non-pusher type seals either in single or multiple springs, designed and manufactured based on standard dimensions and fits to most pumps. Can be available in complete sets or separately in rotary parts and stationary seats only to provide choices suitable to customers' specific applications. ALTUS-SEAL component seals are fully equivalent to American, European & Japanese standard seals (available in metric and imperial sizes). 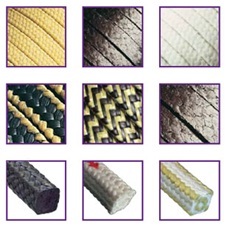 We offer a wide range of seal material choices based on our customers' requirements. We also recommend seal materials based on seal application. ALTUS-SEAL is capable to supply a wide range of seals for OEM equipment or the so-called equipment-specific mechanical seals. Mechanical seals for various pump manufacturers and models such as Grundfos, Blackmer, Flygt, Alfa Laval, APV Puma, among others can be supplied easily. 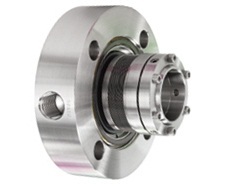 Special mechanical seals for other popular OEM rotating equipment such as compressors, mixers, agitators and reactors are also offered. We can also supply mechanical as per actual sample or cross-sectional/dimensional drawings. Mechanical seals in this category are high-end mechanical seals wherein temperature limitations prevents the use of other mechanical seal types. 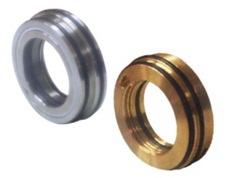 Metal bellows or welded metal bellows seals are specially designed for high-temperature and critical applications. They are balanced seals, self-cleaning, no hang-up and even face loading at 360 degree surface. 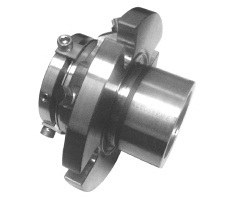 ALTUS-SEAL Metal Bellows are designed for hard to handle media in chemical and petrochemical industries, water distribution and sewage, boiler and paper mills, power plants, steel industry, oil refineries and other applications. The most popular for this type is 1800 and 1900 metal bellows. 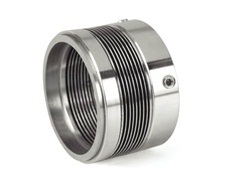 Type 1800 is a metal bellows seal with an O-ring secondary seal. Choices of secondary seals can be Aflas, Kalrez and Chemraz. Type 1900 metal bellows is designed for higher temperatures utilizing formed grafoil as secondary seal. Cartridge seals are mechanical seals completely mounted in one assembly taking advantage of an easy and damage-free installation. We have a range cartridge seals for general purpose to heavy duty applications in Power Plants, Chemical Plant, Pulp and Paper, Sugar Mills, Steel Mills, Mining, Food Processing, Boiler and Water Distribution and Sewage. Among this category are C2200 a 2nd generation inserted rotary seal with non-clogging springs, C2400 a 3rd generation double balanced design and solid modular seal faces and SCS a 3rd generation double balanced self-aligning stationary cartridge design also with monolithic seal faces. 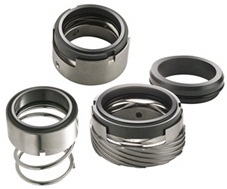 Low-cost convertor cartridge seals are also available for customers switching from mechanical packing to mechanical seals. The seal of choice for medium to critical applications with abrassive, corrosive, and viscous mediums in Petrochemical Plants, Oil and Gas Refineries, Chemical Plants, Boiler, Sugar, Mining, Power Plants and Bio-engineering Industries. The ALTUS-SEAL Cartridge Bellows Full Graphite (CBFG) series of cartridge seals utilizies true-modular cartridge design and construction that conforms to the API 610/682 specifications. This elastomer-free design uses graphite rings in all primary sealing surfaces can accomodate temperatures as high as 425 degree Celcius (800 degrees Fahrenheit). 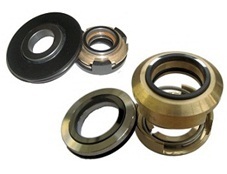 ALTUS-SEAL Bearing Protector series are the first mechanical oil seal and premium bearing seal available. These are compact cartridge mechanical seal that perform functions where standard oil seals had failed. It protects the bearings of rotating equipment by sealing the bearing lubricants preventing the entry of dust, moisture and other contaminants to the bearing chamber. Unlike standard oil, lip, and labyrinth seals, they do not cause shaft damage. Our bearing protectors is the best solution for pre-mature bearings and equipment failures. Mechanical Packings or stuffing box packings are available for a variety of equipment including but not limited to pumps, mixers, valves, and others. performing under a wide range of operating conditions. Multi-purpose packings offer an economical standardization solution for most rotating equipment with non-critical applications. We offer a full range of materials using Acrylic, Flax, ePTFE/Graphite, Carbon, Graphite, Aramid Fiber, PTFE, 100% GFO®, Fiberglass, Babbit, Flexible Graphite, Aluminum and other materials including food grade and FDA compliant. Where there are rotating equipment parts, valves, and pipes to be joined where pressure is present, gaskets are always needed. Gaskets allow "less-than-perfect" mating surfaces on joined parts where they can fill irregularities. 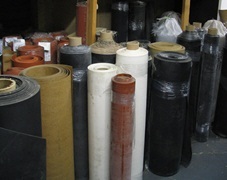 ALTUS-SEAL has a wide array of gasket material in rolls and sheets including Compressed Non-asbestos, EPDM, Buna-N, Teflon (PTFE), Flexible Graphite, and Rubberized Cork ideal for a wide variety of applications in all flange types and conditions, boiler and pressure vessel manholes and handholes, heat exchangers, miscellaneous lids, access plates, ducts, among others. 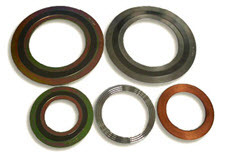 Spiral-wound gaskets are special semi-metallic gaskets made for applications with high temperature variations (thermal cycling), and/or pressure variations, and/or flange rotation problems and other conditions where gaskets with adequate residual stress (stress retention) and flexibility are needed. ALTUS-SEAL Spiral Wound Gaskets are manufactured according to ASME B16.20 specifications and designed for use in ASME B16.5 flanges. Full range of filler material choices are available including fire resistant and stainless steel windings (AISI 304/316). Copyright (c) 2012 www.altus-seal.com. All rights reserved. Design and development by mint-code-box.